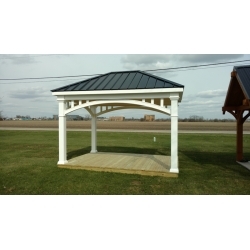 We are the Central Ohio dealer for Weaver Barns. 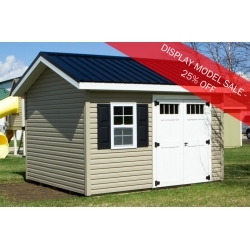 We currently have 11 display models on our lot. The buildings are always open, and we encourage you to browse them anytime. During business hours we would be happy to answer your questions or prepare an estimate for you. Feel free to Visit the Weaver Barns website and see the full range of possibilities. 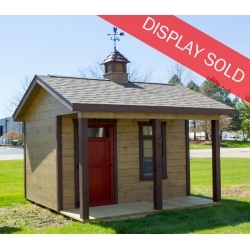 Please note that due to the dealer program set­up by Weaver Barns, we are actually able to offer better pricing on barns & sheds within our local delivery area (30 miles) than Weaver Barns can offer from the main factory lot in Sugarcreek. Enjoy browsing their website but be sure to see us at the lot in Dublin when you are ready to make your purchase! We have catalogs and pricelists available at our store here in Dublin. But if you prefer you can download a catalog and pricelist below - just note that these are fairly large files. Click Here to view the 2019 Weaver Barns Catalog with Pricing - Z4 (PDF file - 8.8MB). Below you will find pictures, prices, and information about the current displays we have on our lot. 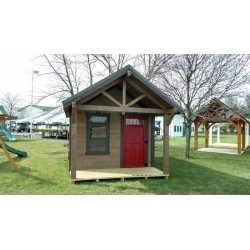 All sheds do need to have site prep done ahead of time to make sure that the building is sitting level, will not settle and that good drainage is provided for. Site prep is the responsibility of the client and what is required will vary with each installation. We recommend that clients speak with Yoder Site Prep to get a quote for this work. Below you will find a link for their brochure with contact information as well as general pricing guidelines and options. Additionally, you will see a link for 5% Discount coupon should you decide to use them. You are certainly free to obtain site prep via any method you choose, we simply offer Yoder Site Prep as a reliable option. Click Here to view the 2019 Yoder Site Prep Brochure with Pricing (PDF file - 1.2MB). Click Here to view the 2019 Yoder Site Prep Discount Coupon (JPG file - 1.6MB).